Auckland Art Festival is in progress at the moment and there was a festive atmosphere in Aotea Square this afternoon. The town hall stands amongst a collection of newer high-rise buildings and various pop-up installations of the festival. I sat with my back to a wall to sketch but still attracted a few curious passers-by! A talented group of musicians was performing a medley of comic operatic pieces and other musical snippets and it was nice to have this accompaniment as I sketched. A perfect exercise in single and multi-point perspective! I hope to see this square in reality in a few days. Yes, the perspective was challenging! Can’t believe you will be here soon! Excited!! Your art style is beautiful! I would love to see these illustrations in novels! Love the balance of the blue sky with the soft yellow! I really like your style of drawing and painting ! It’s something I’d definitely love to try ! Everything what everyone has said and it’s very relaxing to look at. Thank you! It’s a great hobby to have, and helps me unwind from the day job! All the sketches are so damn beautiful! Reblogged this on ROMI BLOGS. Very nice sketch-successfully captured so much detail! Keep up the good work! Very nice! I wish I had your talent! 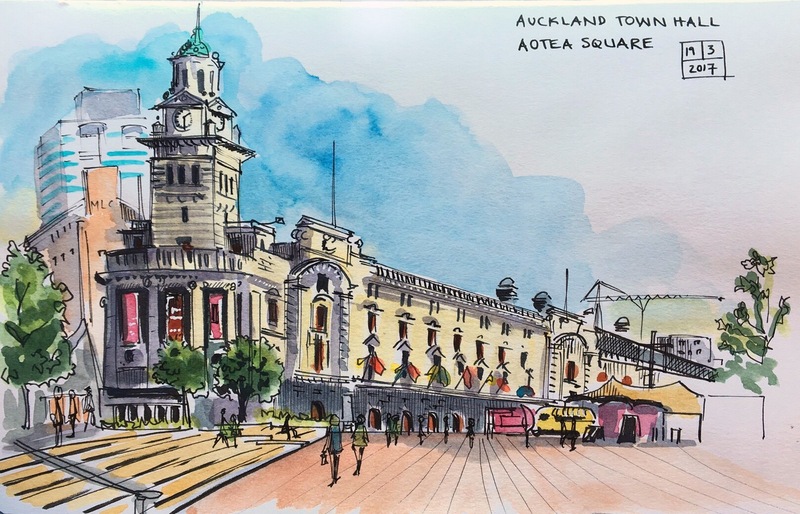 Pingback: Auckland Town Hall — Tabitha’s sketchbook — С любовью к людям! Pingback: Auckland Town Hall — Tabitha’s sketchbook — До каждого с миром!